There were a few riders attempting to get a look at the line without sliding down it inadvertently whilst wearing their tap shoes. One of them, who appeared to be a local or was trying to make himself out to be, explained it to us as such, “Down to a hard left followed immediately by a hard right.” I’m not one to question local trail beta, but that didn’t make any sense to my brain. It looked much better to go high and hit it straight all the way through. I didn’t offer my opinion as they didn’t seem too interested in it. I rolled up, staying right of the line and higher to be able to hit the roller and avoid trying to turn at high speed. It worked quite beautifully and I found myself hurling down the backside of a mesa with no idea of what was coming around the corner. As soon as my tire rolled out of the first drop, there was another to take its place. I held on using brakes and slight nuances of my pedals to avoid being thrown off my bike all the while maintaining the momentum necessary to keep the wheels rolling. The obstacles were big enough and close enough together that my brain kind of shut off and my body just did its thing entering a hyper-focused state of riding. Which is a nice way to say I was in survival mode. The drops continued for a few hundred feet and then the trail returned to normal singletrack as it made a couple of switchbacks before dropping down a waterfall. Finally, I was able to regain some sense of what I was riding and come to a stop. You could say that I am in a committed relationship with the trails in St. George. This month marks the 20th year since I was first handed a 10mm box end wrench and told to adjust a set of cantis. My tires have been roaming this side of the state ever since with only brief intermissions to sojourn in the Southern Hemisphere. I live here because of the trails, but there is something exciting about the unknown. Something that regardless of how you feel afterward, titillates your senses and makes you want to sneak away for some more. Sometimes you just need to get some strange. This past weekend found the Mooseknuckler Alliance in Sedona, Arizona. It had been six years since I last rolled some fatties on that sandy soil. And this time around I was fully prepared for the weird forces of the vortices. 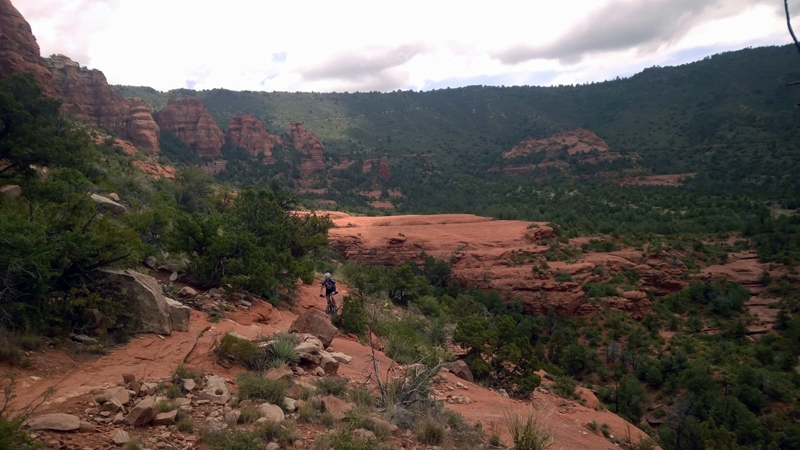 We had a list of three, three trails that were said to be the hardest in Sedona. I don’t recall where this list came from or on what authority it was given, but there it was nonetheless. It went like this, Hangover, the Hog stuff and Hiline. We were supposed to be taking it easy seeing that one of us had a broken rib and a torn ligament in his shoulder, but we figured we could knock ‘em out anyway. We started with the hardest, Hangover. One thing about Sedona, every ¾ of a mile the trail changes name, or so it seems. We did Hangover using a dirt road and a couple of trails for access and exit. The dirt road we were told is usually shuttled. We pedaled it up to Cow Pies Trail which connected us to the entrée. Heather Gilbert and Kathleen Berglund negotiate one of the many wash crossings on the Girdner Trail. If I had to describe Hangover with one word, it wouldn’t be exposed, it would be off-camber which I guess might be two words. Anyway, a decent amount of the trail is on slickrock. Off-camber slickrock that is then exposed. It took about half the ride to start to get the feel for what the sandstone had to offer in terms of traction, but once figured out, the trail began to roll a bit more smoothly. With that said, this trail takes the pucker factor all the way to 11. The section that I assume gives it its name, is an exposed ledge that is bordered by a wall that tends to hang out over the trail pushing you toward the drop. Plus the trees that clearly were placed before wide handlebars became a thing. Using Munds Wagon Trail, we made it back to our vehicle for lunch and recovery. Seeing that we were taking it easy, we went ahead and did another ride that afternoon. We were shooting for a bout ten miles. Starting at the Bike and Bean, we used Slim Shady to access HT and go under Highway 179. From there, we picked up Little Horse and made our way to Chicken Point. This is where things got interesting as we jumped on High on the Hog which took us up to the ridge, gave us a little exposure and a couple of moves before dumping us on Hog Heaven. With more of the same and big smiles we made our way out using Mystic, Cathedral and the Bell Rock Pathway eventually finding our way back to the Bike and Bean. At this point we were ready for some sustenance. The Alliance headed to the Oak Creek Brewery where we found ourselves in a long line of hungry people. Somehow we made our way to the bar and found some seats which meant that we quickly had beer and food completing a big day of riding. 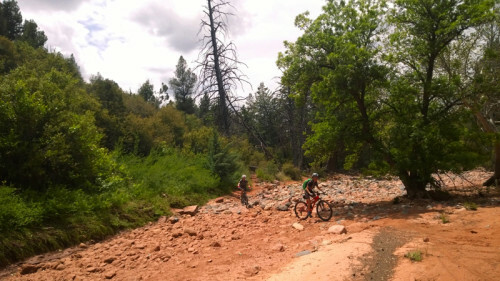 We were committed to taking it easy the next day and found an “easier” 23 mile loop in the Upper Dry Creek Area Trails. I won’t bore you with all the details, but be sure to hit Dead Man’s Pass, Chuckwagon and Aeries while avoiding Girdner. This ride is paired well with some Vegetable Tempura rolls from Takashi Japanese Restaurant. Just don’t order two because they’re kinda big. And finishing out the trifecta on what was my favorite ride, Hiline. It gives you the views and some exposure but packs most of its technical moves into the drop off the back making it a bit easier. I highly recommend snubbing your nose at Sedona’s “anti-vagrancy” laws and taking a bath in the creek as you ride Baldwin back to Slim Shady. This is best done with a mid-ride beer in one hand. The nice thing about cheating on your local trails is that when you get back, they don’t care and you get to continue enjoying them with a smile on your face knowing that you can stray whenever you want.